Horseshoe crabs live primarily in and around shallow coastal waters on soft sandy or muddy bottoms. They occasionally come onto shore to mate. Horseshoe crabs superficially resemble crustaceans but belong to a separate subphylum of the arthropods, Chelicerata, and are closely related to arachnids. Horseshoe crabs are closely related to the extinct eurypterids (sea scorpions), which include some of the largest arthropods to have ever existed, and the two may be sister groups. The earliest horseshoe crab fossils are found in strata from the late Ordovician period, roughly 450 million years ago. 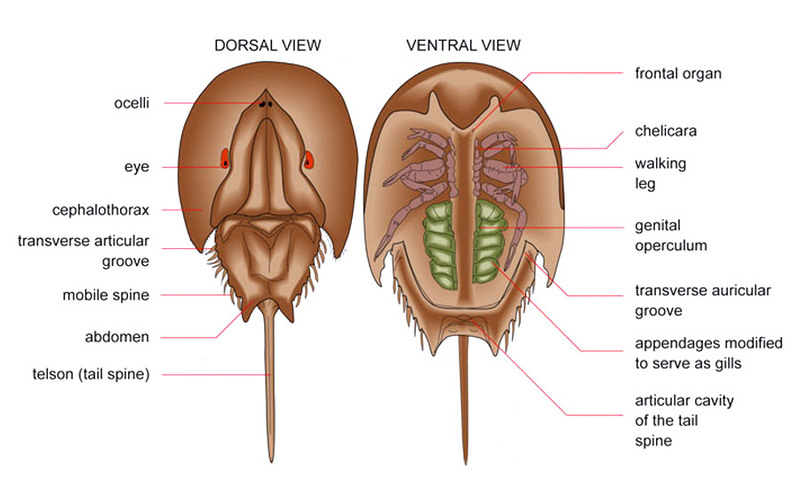 Morphology of a limulus (horseshoe crab): marine arthopod which lives near the shore. Frontal organ: organ of the horseshoe crab situated at face-level. Chelicera: a pair of venomous hooks situated on the head of a horseshoe crab. Genital operculum: structure covering the opening to the genital organs. Transverse auricular groove: shallow impression related to the ear. Appendages modified to serve as gills: leaf-shaped leg. Auricular cavity of the tail spine: cavity related to the flexibility and movement of the telson. Telson (tail spine): barb at the end of the horseshoe crabs tail. Abdomen: posterior part of the body of a horseshoe crab. Mobile spine: movable tail of the horseshoe crab. Cephalothorax: head and thorax of the horseshoe crab, which together form one section of the body. Eye: sight organ of a horseshoe crab. You may be interested in First warm blooded fish ever discovered.